I hate Easter. Plain and simple, I’ve hated it since I was 14 years old and my Mom and Sister died a week after Easter. It’s a holiday I’d really rather just ignore. But, I now have a 2 year old. And it’s not fair for me to ruin his Easter just because I see it as a tainted holiday. So, what does one do to celebrate Easter with a 2 year old? We aren’t particularly religious, so the religious aspects of the day aren’t likely to be highlighted (one day we will explain the Christian significance it to him and let him make his own decisions, but not at 2). Anyways, last year and the year before we kind of completely dropped the ball and didn’t do anything other then make a nice dinner. But I’m thinking we need to start doing a bit more now that Little MPB is old enough to understand. We will make a nice Easter dinner, but I’m pretty sure Little MPB wont care about a nice dinner. In fact, I suspect he’ll hate the nice dinner, simply because he does that sometimes. But, what do we do for Little MPB? Do we do a little Easter egg hunt? Do we give him Easter themed gifts? When I was little we did an Easter egg hunt and usually got a stuffed Easter bunny or something similar. Mr. MPB’s family just did an Easter egg hunt without any additional gifts. I am thinking of filling up plastic eggs with some fun things like chocolate and stickers and maybe a small toy or two. 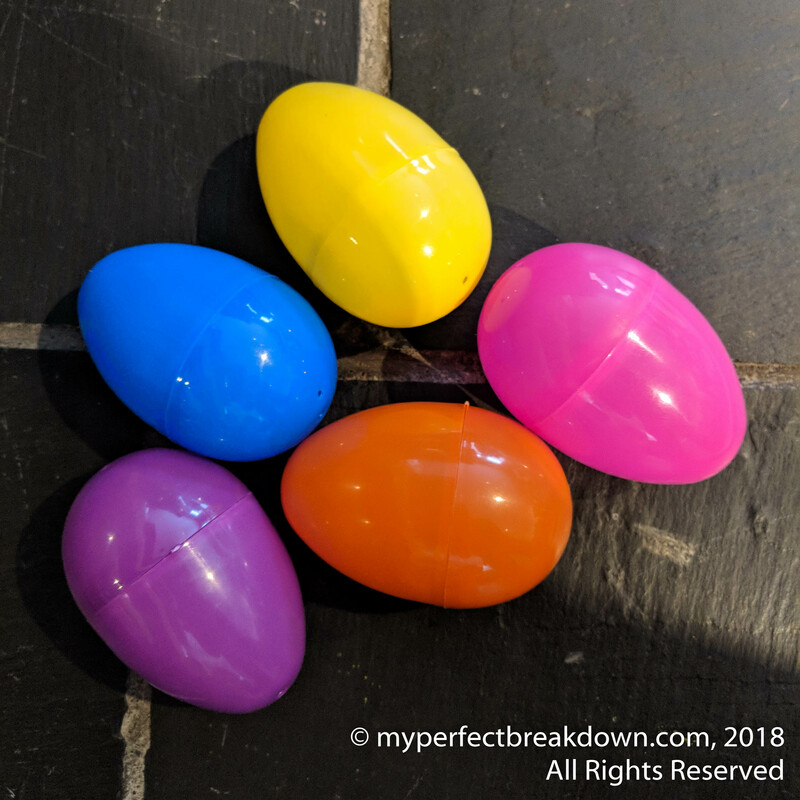 I think little chocolate eggs everywhere will be a bit too hard for Little MPB to find, so these plastic eggs seem like a good idea for his age. And, I’m also thinking I don’t need to feed a 2 year old a tonne of chocolate. So I’m wondering, how many eggs should I fill up? Are the five that I happen to have already enough, or should we hide a few more? I assume I should probably get him a little Easter egg basket? Oh, and when do people decorate Easter eggs with kids? Is that a craft we should be trying to do this weekend, in advance of Easter? Or should we do it next weekend, on Easter weekend? I’m also being realistic that he’s only 2 and I suspect he’ll be happy and excited no matter what we actually do. Easter basket for the “hunting” and you can buy a bag of plastic eggs for super cheap. Put mini toys in them or coin change for a piggy bank, candy in a few, and hide them through the house/yard! As for decorating eggs, saturday before easter is when we typically do them, since we use them in the hunts on sunday. You don’t want boiled eggs sitting around for a week! My daughter is a year old, and we’re going to our first easter egg hunt this weekend. She was only 3 months old last year on Easter so she didn’t get to do much. We do a big easter brunch at church and then lunch with family – Instead of the easter basket, I’m buying her rain boots and stuffing them with her favorite snacks and a new sippy cup and a bubble machine. I saw it on pinterest and thought it was super cute! Holidays with kids is always so different – I’m not a huge holiday person, and for 4 years I didn’t do much to celebrate. But the past year i’ve wanted to do things for HER, not just because we had to. They make everything so much more fun! Something like this instead of the basket – since the basket will end up shoved in a closet the rest of the year! 5 eggs seems fine – plus you can take them out and hide them again, M loved that last year. We just washed the plastic eggs and put things in we knew he liked, like Cheerios and little graham crackers. Yea, the story of Easter is pretty violent when you think about it, and then there is the whole melding of secular and religious. Yea, totally behind the waiting for that talk until he’s older. We always dyed eggs the day of Easter and would take turns hiding plastic eggs in the backyard. I imagine 5 eggs is a good start, especially when he’s just figuring out the game. And stickers, small toys, and chocolates sound fine. I can’t remember getting big gifts at Easter. I feel like that was always a Christmas tradition. But since you have a little boy, and I’m looking forward to this as well, the little three piece Easter suits are probably going to be the highlight for me! We do a basket with candy and a stuffed animal, and dye eggs sometime the week before. It might be worth it to look around for an Easter activity to take him to. We go to a state park near us that has a bunch of stuff: egg hunt, baby animals, Pics with the Easter bunny, a fancy buffet lunch. It’s become a favorite tradition already. Those eggs are perfect for his age and maybe 2 little eggs in each one and stickers sounds great. I usually do the hunt in the garden and guide T round to the right area. We usually make our crafts on Easter weekend, don’t get anything too fiddly or that will take too long otherwise you could be disappointed if he loses interest 😂 Just talking from experience! We usually set out a little Easter display on our coffee table for Easter week too, just with her basket on it, some Easter themed soft toys and a few fluffy chicks. I hope you have a fun ‘first Easter’ and maybe create some memories to make this time of year that bit more bearable. Ugh. Easter. I’m seriously considering skipping it this year because I just don’t have the energy to get creative. Usually we do a family brunch, but everyone is out of town this year, so it’s just the hubby, me and H around. Our yard is too small to do an egg hunt, but your post inspired me to maybe do one indoors. Likely the little plastic eggs with some of his favourite things tucked inside, like stickers and one or two small toys. Maybe the Lindt chocolate bunny he was eyeing up at the grocery store yesterday…even though he likely won’t eat it and mama will have to take care of that! Maybe instead of an easter basket get little MPB a beach bucket that he can put the eggs in? That way it’s something he will use in the summer or he can even use around the house all year round to haul his toys around in. Or make up a little gift pack of a new colouring book and stickers or something instead of chocolate? I’m grasping straws coming up with ideas because I’m so not into Easter either. I got a dozen of those plastic eggs for under $1, and I plan on filling them with goldfish, puffs, yogurt melts, etc. For her basket I got her a couple outfits, sandals, some books, and bubble bath. My family was never big on Easter, and isn’t religious at all. We’ll probably have a nice dinner. My family is here this weekend and the kids want to dye eggs, so we’ll see how that goes! I’m sure whatever you guys do, little will have lots of fun! I’m not into Easter either! But for some reason having a toddler makes me want to do an egg hunt as well! Hope it goes well and I’m enjoying reading the suggestions here. I agree with you completely about Easter! I am an atheist and so the religious significance is lost on me – I understand what it is supposed to represent but I don’t believe. If it were up to me we wouldn’t celebrate, but my husband’s family is very religious and so he likes to celebrate, more so for the “tradition” than anything else. So for Easter we got McLovin a Yoda Easter basket, and I bought him a book and a small toy. That’s it. We are going to my mother’s for dinner and my stepfather’s sisters will be there. I am going to take McLovin to our town Easter Egg hung at our historical society because some of my friends are going, and I like to take any chance to get him playing and socializing with other little kids, but that’s about it!